Black Kite (Tobi - Milvus migrans) above Nokogiriyama, Kisarazu City, Chiba Prefecture on January 25, 2009. The color of winter in Mito City, Ibaraki Prefecture on February 7, 2009. Panorama of the Pond in Yoyogi Park, Shibuya-ku, Tokyo Metropolitan District on March 29, 2009. 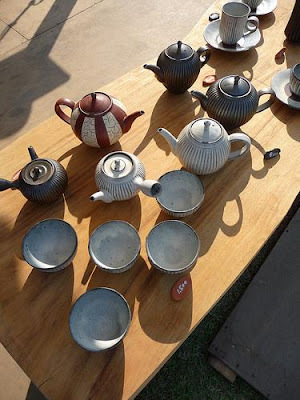 Pottery for sale in Kasama, Ibaraki Prefecture on April 29, 2009. 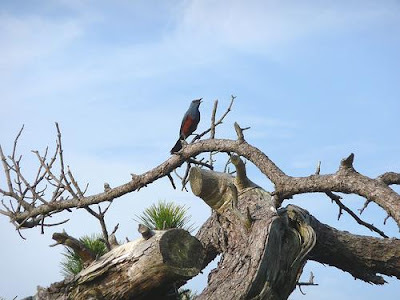 Isohiyodori (Monticola solitarius)in Izu Kogen, Shizuoka Prefecture, Japan on May 31, 2009. Sunlit spires of Mizugakiyama, Hokuto City, Yamanashi Prefecture on June 7, 2009. Children's outdoor kabuki. 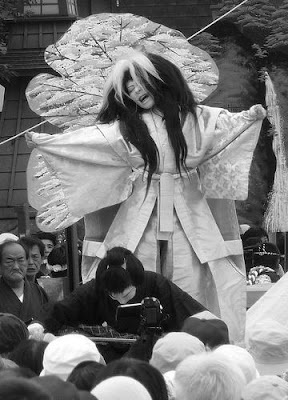 The 12 p.m. performance of "Hebihime" in Karasuyama, Tochigi Prefecture on July 25, 2009. 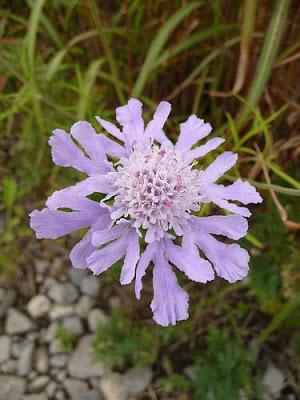 Matsumushiso (Scabiosa japonica). Kirigamine, Suwa City, Nagano Prefecture on September 6, 2009. 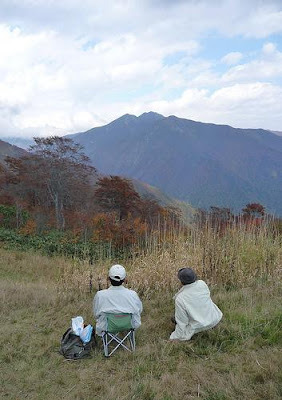 Painters looking at the peaks of Shiragamon, Kasagadake and Asahigadake. Tenjin no Daira, Minakami Township, Gunma Prefecture on October 18, 2009. 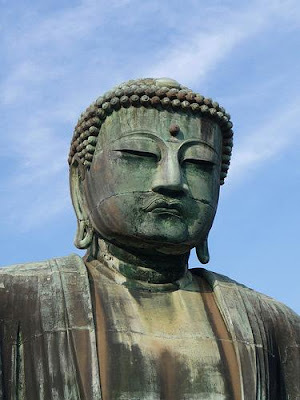 The Amida Nyorai of the Kotokuin. Kamakura, Kanagawa Prefecture on November 8, 2009. Surfers await a wave before Mt. Fuji. Fujisawa City, Kanagawa Prefecture on December 6, 2009. ...because in order to feel disappointment one had to have had strong expectations of a positive outcome. The lead article of the latest edition of the magazine Shukan Asahi brings together a passel of politics mavens to rate the performances of various members the Hatoyama Cabinet at this, the year's end. Receiving the highest score of 96 points from the judges is, unsurprisingly, State Minister for Administrative Reform Sengoku Yoshito. The minister responsible for the sessions that shone a light into the national budget's darker corners, Sengoku looked more like a goat than a hero when Democratic Party Secretary-General Ozawa Ichiro stripped the Government Revitalization Unit of all its freshman members after their nominations had already been announced. The GRU's exposure of the astonishing variety of failed or moribund projects still drawing funds from the public purse resurrected Sengoku's stature. He will remain in political hot water for some time, having been one of the first Democrats to call for Ozawa's resignation as party leader after the arrest of Ozawa's political secretary Okubo Toshinori in the spring (Okubo's trial started on Friday). In terms of the achievements he has overseen, however, Sengoku is in fine fettle. On the other end of the ledger, receiving the rock-bottom score of 24 from the Asahi Shukan judges is, unfortunately, Chief Cabinet Secretary Hirano Hirofumi. 3) keeping the government's program on course in the manner of a duck swimming: moving forward smoothly and seemingly effortlessly on the surface, paddling like all heck underneath. Based on these criteria, can one argue that Hirano does not deserve the miserable rating he has received from the Shukan Asahi judges? Most everyone is dumping on Prime Minister Hatoyama Yukio for his vaporous pronouncements, his too quick willingness to appear in agreement with his interlocutors (when in his heart, he knows that he does not agree with them) and his hanging on as if for dear life to the promises made in the DPJ's Manifesto. Everyone knew about these attributes (they should not be contemptuously derided as faults - that is too easy) of the man before he became the PM. In criticism one must be accurate...and not criticize the wrong man for the wrong thing. It was Hirano's responsibility to mitigate the potential bad effects of the PM's more incorrigible habits as well as rein in the quirks of this decidedly quirky cast of Cabinet officers. If Hirano did not think himself up to the task of ringmaster of this circus then he should not have accepted the position. Hatoyama's mistake, for which he should be criticized, was in offering the Chief Cabinet Secretary post to Hirano, his faithful lieutenant, rather than to a more forceful and independent-minded candidate. A prime minister of course needs a loyalist in the Chief Cabinet Secretary position. He also needs someone who engages himself/herself in the management of the government with relish, dispatching enemies and cowering allies with a sharp mind and an even sharper tongue. Hirano so far does not seem to fit that bill. Over the New Year's holidays the PM, Hirano and other DPJ members of the Cabinet have the time to meet and talk about what worked during these first few months and what did not. It is possible that out of these discussions new management structures or understandings of roles will emerge. The current government is far from disfunctional. Nevertheless, its indiscipline is generating too much far too much news. A more energetic, even volcanic Chief Cabinet Secretary seems a necessary first step to a smoother-running policy-implemention machine. Mike Mochizuki and Michael O'Hanlon on the Futenma agreement and the responsibilities of a Japan enjoying a more equal parternship with the United States. Brought to us via the good offices of The Washington Times. From the editorial on December 17, 2009, purportedly on the subject the Democratic Party of Japan Secretary-General Ozawa Ichiro's rubbishing of the protests of Imperial Household Agency chief Haketa Shingo against the acceptance of the Chinese government's request for Li Xinping Xi Jinping's audience with the Emperor, in defiance of IHA protocols. The DPJ is seeking a revision of the law that would forbid the director-general of the Cabinet Legislative Bureau -- the office of the government that has come to be the source of interpretations of the Constitution -- from giving testimony in the Diet. It seems they have a notion that it is up to the politicians to interpret the Constitution and for bureaucrats to just follow in line. The Imperial Household Agency and the Cabinet Legislative Bureau are the specialists in determining whether laws are in compliance with the Constitution or not. It is a matter of course that their opinions be listened to first of all in a spirit of humility and cool-headedness. Leadership of politicians does not mean that one can just interpret the Constitution any way one wants to, ignoring accumulated precedents. It is even worse to use high-pressure language in attempt to cower bureaucrats and silence them. One cannot fall into this error. Now I have a whole lot of problems with this editorial (that "It seems they have a notion that" strawman, for example) but none greater than with the "It is a matter of course" (tozen da) exhortation. Article 81: The Supreme Court is the court of last resort with power to determine the constitutionality of any law, order, regulation or official act. That under the five decades of LDP rule the Supreme Court exercised its right to declare laws unconstitutional a pitiful number of times does not mean that the Supreme Court will forever fail to carry out its role under the separation of powers. Only that during the last five decades the Court felt cowed by the LDP and the bureaucracy. And that, me hearties, strikes me as unhealthy. As for the humbling authority the Asahi attributes to the CLB and the IHA "as a matter of course," it seems Richard Samuels' question still applies. Evidently, the revolution underway in Japan has not yet extended its reach to the editorial offices of the nation's media giants, not even its purportedly most liberal ones. It is not a stalling tactic or a demonstration of a single man's lack of decisiveness. It is not an example of perfidy or strategic ignorance. It is not an example of Fukushima Mizuho's mesmerizing powers of persuasion. It is what in poker is referred to as a call. By SHINO YUASA (AP) TOKYO — Japan needs several more months to decide on the relocation of a major U.S. military base on the southern island of Okinawa, Prime Minister Yukio Hatoyama said Tuesday, a delay likely to frustrate Washington. After describing in ominous tones the threat of a breakdown of Japan-U.S. relations should Prime Minister Hatoyama Yukio deviate from the path laid down by the previous regime and disgraced former Vice Minister Moriya Takemasa, those who warned of an apocalypse need to hope that hellfire and brimstone rain down forthwith upon the Japanese government's head. So far, the responses have been less than infernal. No, of course not. The Democratic Party of Japan never said that it wanted indefinite talks. The DPJ wants Futenma moved just as much as anyone. What the DPJ asked for was a review together with the United States of a plan that had languished in limbo for 12 years, unenforceable by the very party that drew it up. Which begs the question: who in the U.S. Administration made the decision to test the DPJ's willingness to bet the whole Japan-U.S. relationship on the DPJ's promise to review the building of a heliport off the coast of Henoko? Because whoever that was, he or she has miscalculated. The DPJ did not fold. Believe the DPJ policy unrealistic, call it airy-fairy, the party leadership has held its ground. "We promise to propose revisions to the Status of Forces Agreement and will furthermore address the realignment of U.S. Forces, the role-and-placement of American military bases and other matters from the point of view that a rethink may be in order." Whether or not one may believe the move of the elements of the Futenma Marine Corps Air Station to a new base to be constructed over a coral reef off of Camp Schwab in Henoko City is a good idea; a bad idea but the best we can do; an unkept promise to the United States government; or a betrayal of the Okinawan people, one needed to at least understand that if the DPJ were to include the pledge in its manifesto and then win a smashing victory at the polls, the party was going to do its damnedest to deliver on its promise. It is a measure of the cynicism of the views of those monitoring the political speech of this blessed land that Washington was not informed of the DPJ's sincere commitment to the promises it was making to the electorate. Over at Arms Control Wonk, Dr. Jeffrey Lewis has a note on why the nuclear-warhead tipped Tomahawk Land Attack Missile (TLAM-N) possibly does not deserve the love given to it by Japanese officials last year. Just how heretofore unnamed Japanese officials got the go-ahead to lobby the Congressional Commission on Strategic Posture of the United States -- a body headed by former U.S. Defense Secretary William Perry -- to recommend that the Pentagon keep the nuclear TLAM-N, a weapons system the U.S. Defense Department wants to scrap, when Japan is ostensibly opposed to war in general and nuclear war in particular, without the public being alerted to these lobbying activities and without a uproar in the press or a housecleaning in the responsible ministries after the news of the lobbying activity becoming public, is beyond me. The reason why the TLAM-N may not be a worthwhile weapons system? It's a little problem called "clobbering." For the Commission's final report on America's nuclear posture, visit this page at the United States Institute of Peace. If you can't determine whether to accept or decline a sacrifice, accept it. The Imperial Household Agency has seen reason. It is going to allow Xi Jinping, the heir apparent to the presidency of the People's Republic of China, to have an audience with the Emperor sometime this week. The hyper-sensitive bureaucrats of the Agency baulked at giving up one of their prerogatives: insisting on one-month's advance notice for anyone wishing to meet His Highness. It must have been especially galling to give up their precious to Ozawa Ichiro, currently leading his politial allies and minions on a visit to China. Given the Democratic Party of Japan's ownership, for the time being, of majorities in both Houses of the Diet, annoying the Secretary-General of the Democratic Party of Japan with tendentious adherence to internal regulation (How, if the rule was promulgated in order to protect the health of the Emperor, does the Imperial Household Agency know how the Emperor will be feeling in one month's time?) is probably not the smartest thing to do. Next year's Agency personnel budget might end up a little bit on the tight side, possibly. By taking the course of valor, the Agency is allowing the possible emergence of a new tradition in China. Current President Hu Jintao also met with the Emperor when he himself was in the dauphin position in the Politburo. Up until the fall of the Qing in 1910, the imperial institution in China granted symbolic legitimacy to those who ruled in East Asia, both the mandarins of the central Chinese Imperial Government and the kings of the countries surrounding China (Japan's tenno being the notable exception). Each new accessor to power remained symbolically less-than-legitimate until it received the Chinese emperor's imprematur. China's present day rulers, having ground China's own imperial institution into ash, are bereft of a suitable symbolic assessor of a candidate's suitability for leadership. A visit to Thailand, the last survivor of the tributary kingdoms, might possibly provide a link to the past. It would, however, represent a humiliating reversal of status for the Chinese supplicant. Visits to the barbarian capitals of the former slaves of the Vikings (Moscow) or that rabble of rebellious barkeeps and farmers (Washington) would send all the wrong messages about the direction of history's flow. A visit to one of the great capitals of Europe would be even worse, admitting European justifications for colonialism were not utterly without merit. However, Japan's imperial house provides is a direct link to a past purely East Asian and very nearly a meeting among equals. When the incipient leader of modern China meets the ancient line of Yamato, each side gains honor. That the Japanese would go against their own rules and receive China's heir apparent at short notice would be proof just of the greatness of China but the greatness of the one chosen to lead China. That relations between two traditions are chilly, with the Emperor's father as one of China's grand historical baddies, gives the whole rushed application a frisson of uncertainty. Xi might just want to show that a junior Chinese leader can importune the Emperor. I expect that when the two meet, Xi will not contort himself into an L-shape like that young American president did. 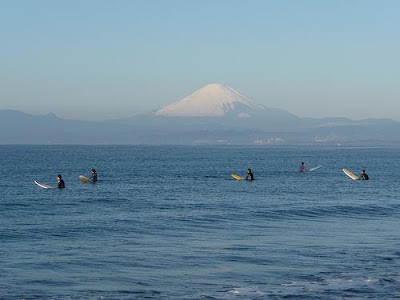 Looking at the border of many of the blogs on Japan, one cannot help but notice it: many who write on Japan tend to also try to capture its physical image. There seems to be a strong correlation between blogging and photography, as if the two activities are of a kind. Both seek to record a moment as it "really" (and yes, the quotation marks are necessary here) happened, frame it in an own idiosyncratic way, heighten the details, label the result and then set it out where all the world can see. - Vincent of Achikochi shares the full range of his life between Yokohama and Holland Belgium at http://www.flickr.com/photos/14591708@N00/. Mozilla in Asia provides visual documentation of the life of the peripatetic internet proselytizer at http://www.flickr.com/photos/gen/. Someone at Mutantfrog Travelogue maintains the Flickr site http://www.flickr.com/photos/mutantfrog/. Perhaps all of the co-authors share their images. 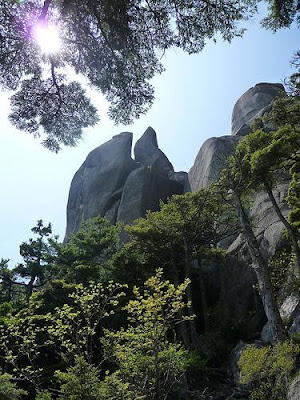 - Phaedrus/CJW of the luminous Climbing and Hiking in Japan provides more jaw-dropping imagery of Japan's peaks, cliffs and alpine bowls at http://www.flickr.com/photos/phaedrusredux/. - Simply beyond category is D of Japan Without the Sugar. whose smashing photo blog http://kanagawaphoto.blogspot.com/ and Flickr site http://www.flickr.com/photos/7280851@N08/ fill me with despair and awe. Worthy of dishonorable mention is the current reigning court jester Our Man In Abiko who offers a typically bent vision of this blessed land at . The exception to the rule seems to be Tobias Harris of Observing Japan. Then again, that Mr. Harris is not fiddling about with cameras is perhaps the reason for his heretofore amazing prolixity. Photo image: Mass model shoot at the beach in Hota, Chiba Prefecture on July 19, 2009. Image credit: MTC. Democratic Party of Japan Secretary-General Ozawa Ichiro travels to China (ever notice nobody calls it "the PRC" anymore?) with 600+ persons in tow, including 146 members of the Diet, one day after the governments of the United States and Japan call off talks on the Futenma situation (let us not call it a "problem" or a "crisis", shall we? Moving Futenma Marine Corps Air Station has been a 12-year odyssey of procrastination). The sight of Ozawa and Hu Jintao on the armchairs in Beijing is sure to drive the U.S. Asian policy community even further into crisis mode. Then again, Ozawa is such a farsighted political player he probably stage-managed the breakdown in talks with the U.S. as an oseibo for his Chinese hosts, confident that he can patch matters up with the Yanks later. He may have already selected the Christmas gift the officials of Japan will be giving their American counterparts this year. In the same way you can trust in the DPRK regime going back on its promises, you can trust in Ozawa's having a plan - a crafty, opaque and unnecessarily infuriating plan -- but a plan, nevertheless. He is that good at his game.